Do you know that Bitcoin ATMs exist? Do you know how to use a Bitcoin ATM? If you don’t, you’ve landed in the right place. In this tutorial, I will explain how to use a Bitcoin ATM to buy/sell Bitcoins and also throw some light on how you can locate a Bitcoin ATM near you. Before that, however, a short introduction of a Bitcoin ATM is important. A Bitcoin ATM is much like the traditional ATM that dispenses fiat currencies where you use your debit card to withdraw USD, EUR, INR etc. However, unlike the traditional fiat ATMs, some Bitcoin ATMs actually allow you to withdraw bitcoins from it. Some help you convert your bitcoins into fiat currencies, while there are also some that help with both! A notable aspect of these ATMs is that it allows you to buy/sell bitcoins anonymously. No KYC or AML is required to transact using a Bitcoin ATM which means it is actually a very good way to secure your identity and privacy. However, privacy doesn’t come free. Bitcoin ATMs typically charge between 7-10% for buying/selling bitcoins, a fee worth paying for some of us. But to use a Bitcoin ATM, you need to find it first which is the tough part because of the low number of Bitcoin ATMs around the world. You can find a Bitcoin ATM near you by using the Coin ATM Radar service that provides you the option of searching nearby ATMs using the live worldwide Bitcoin ATM map. 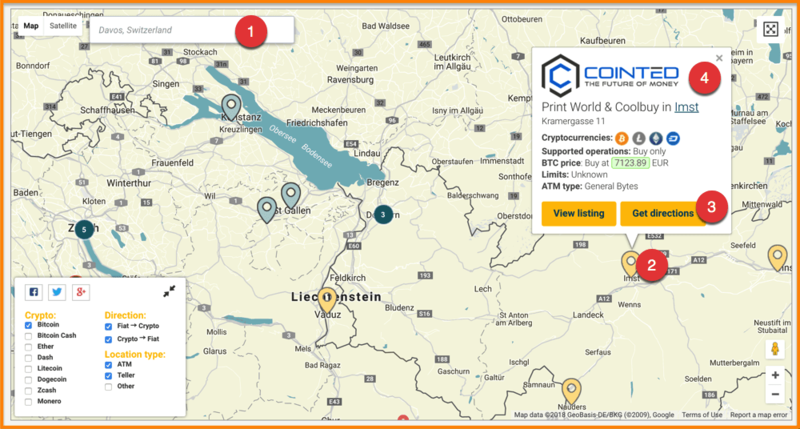 To find a Bitcoin ATM, you can go to the main website that features a live map of ATMs. Add your location/city and click enter to search ATMs (I have added ‘Davos’). Choose the nearest ATM and click to see the details. Click ‘Get directions’ to get the Google maps location and direction. There are a few ways in which you can use the service to locate a Bitcoin ATM near you, the details of which have already been covered in my previous write-up on Bitcoin ATMs. 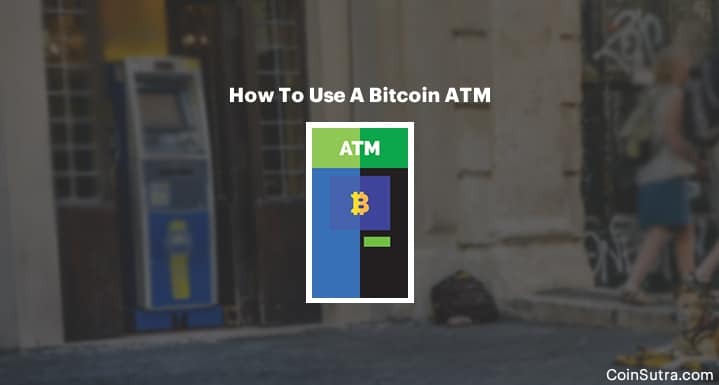 Now, that you know how to find a Bitcoin ATM, let’s dive into how to use these ATMs. Buying/selling Bitcoins through ATMs can sometimes be confusing because there are different types of Bitcoin ATMs. Do not be confused. I will leave you with short video tutorials of some Bitcoin ATMs, so you can check them out and choose depending on the type of ATM you need. Choose to withdraw cash option. Send Bitcoins to given address QR code from your mobile wallet. Now enter your phone number and click proceed. Scan the QR code of the BTC address on which you want to receive your BTC. Enter fiat bill and proceed. You coins will be sent to your BTC address. Using a Bitcoin ATM is an easy option, provided you have a Bitcoin ATM near you. Also remember, some ATMs require you to scan your ID documents and may also ask for your phone number for KYC purposes. But this generally happens when you are purchasing a large number of Bitcoins. And as mentioned earlier, the total number of ATMs around the world are very less and some of them can only be either used to buy bitcoins or sell bitcoins because the two-way type Bitcoin ATM is even rarer to find. To combat such limitations, there are some special types of Bitcoin ATMs which you can use to sell your Bitcoins sitting in a remote location and then can withdraw cash upon completion of the transaction from an ATM that is near you. Some Bitcoin ATMs even accept Bitcoin debit cards so you can also withdraw cash in case you need it while traveling to a foreign country. This feature eliminates the headache of exchanging currencies while traveling abroad. 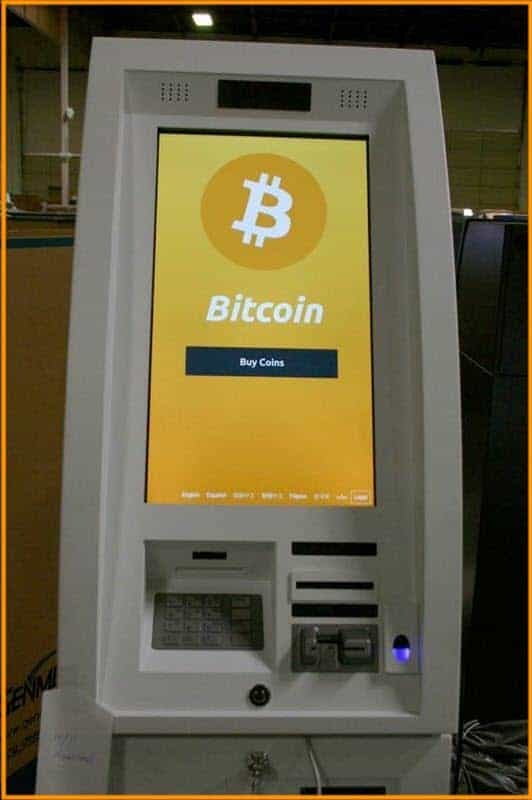 In the coming days, we believe the Bitcoin ATM technology will further be enhanced and we will see numerous Bitcoin ATMs in every part of the world just like the traditional fiat ATMs. If you have ever used a Bitcoin ATM, we would love to hear your experience in the comments section below. What is the name of the app I need to download to be able to sell my bicoins for cash at a ATM. also how much are you allowed to withdraw at a time?